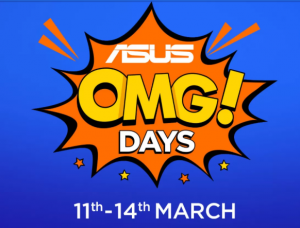 Asus OMG Days – Hello Guys, Flipkart is Organizing Asus OMG Days, In which Asus Powerfull Smartphones will be Sold in Lowest Price. You all Looted Honor Smartphones in Rs.1 from Honor Flash Sale. Asus has One of the Best Smartphones which are sold more than 2 Million in 2018. Again they are sold in Lowest Price Ever So, Buy Best Asus Smartphones in Best Price. Also, They are giving Huge Exchange Offer, So, If you want to Change your Phone Asus Smartphones are Best in these Price. Asus has Powerfull Smartphones with Great Battery of 5000 Mah and Also, Powerfull Performance which has Flagship Processor like Snapdragon 845. Just Check All Phones with Price and Details.